Bumble Beans Basics helps to bring a little handmade love and comfort to those in need through the power of quilting. Quilter Victoria Findlay Wolfe began the charity project as a way to directly help families in need living in her area. Victoria asked friends to help with the charity project, thinking that together they might come up with about 10 quilts. That was literally hundreds of quilts ago, and Victoria is still helping quilters sew to serve others through Bumble Beans Basics! You may feel like you’ve heard Victoria’s name before, and that’s not just deja vu. She is an accomplished modern quilter, author, blogger, and teacher. Victoria’s quilt “Double Edged Love” took home the Best in Show award at the inaugural Modern Quilt Guild quilting event, QuiltCon 2013. Visit Victoria’s official website where you can see more of her quilting work, and click to read about her book, 15 Minutes of Play – Improvisational Quilts: Made-Fabric Piecing Traditional Blocks Scrap Challenges. And be sure to check out her 15 Minutes of Play blog. 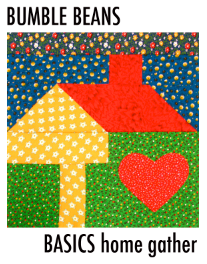 Currently Bumble Beans Basics is coordinating a quilt drive to benefit The Child and Family Institute, located in New York City. Hear Victoria talk a bit about the project here. Quilts are needed to benefit children from newborn to age 3 and twin-sized quilts for adults. The deadline for the current quilt drive ends on June 1st, please check the official donation page for The Child and Family Institute at Bumble Beans Basics for up-to-date information about the deadline, quilt requirements, and where to send donations. If you’d like to help but aren’t sure quite where to start, check out some of the awesome quilting tutorials at Bumble Beans Basics under the “Ideas and Tutorials” tab. Also be sure to check out Victoria’s free tutorial for piecing a sweet house block, perfect for any charity quilt project! Next Next post: BERNINA of America’s New Creative Center is Open!